Mexican consumption tax is 16% – it was 15% at the time of the study. This changes the report. It is incorrect to say that the wealthy pay the highest marginal taxes. It is actually single women with children and the disabled who face the highest marginal taxes, when you consider loss of benefits for earning additional gross income. This article confuses the payment of taxes verses the collection of taxes. Consumers pay taxes, in the final price they pay. The collection points for the multiple taxes the consumer pays in that final price occur along the production process. All taxes paid by suppliers, personal income, corporate income, excise, payroll, real estate, gas, etc. That full price is passed on to the ultimate consumer who also pays all of the taxes accumulated by the producer. If magically there was only one tax based on sales, you would still differentiate between payment of the tax by the consumer and the collection by the corporation, at the point of sale. Theoretically, in the absence of any taxes, you would only have to pay employees their current take-home pay and all tax reductions would go to reducing the price of the final good or service. Therefore a government that taxes at 50% forces prices to be twice as high as they would without tax, since the final price is 50% tax. Marginal motivation to work vs extra income declines with rising income — naturally, all by itself — even before marginal tax rates are applied. Of course taxes, and even more so progressive taxes, make things worse in terms of motivation. There are many brilliant people whom we never hear of, who could have become multimillionaires or even billionaires. But we never heard of them because they said: “Eh, I made 2-5-10-20 million, that’s enough, let’s just take it a little (or a lot) easier now; and so they never attain the headline wealth and fame of the billionaires. What I’m getting to is that there is already tremendous loss of potential prosperity even with current taxes — and if one considers the compounding effect of lower growth then the prosperity loss is truly staggering. In other words, we’re way past the maximizing point of the Rahn curve, and after many years lost potential growth has compounded to epic proportions. In most countries the total marginal tax rate also depends on what you buy with your income. 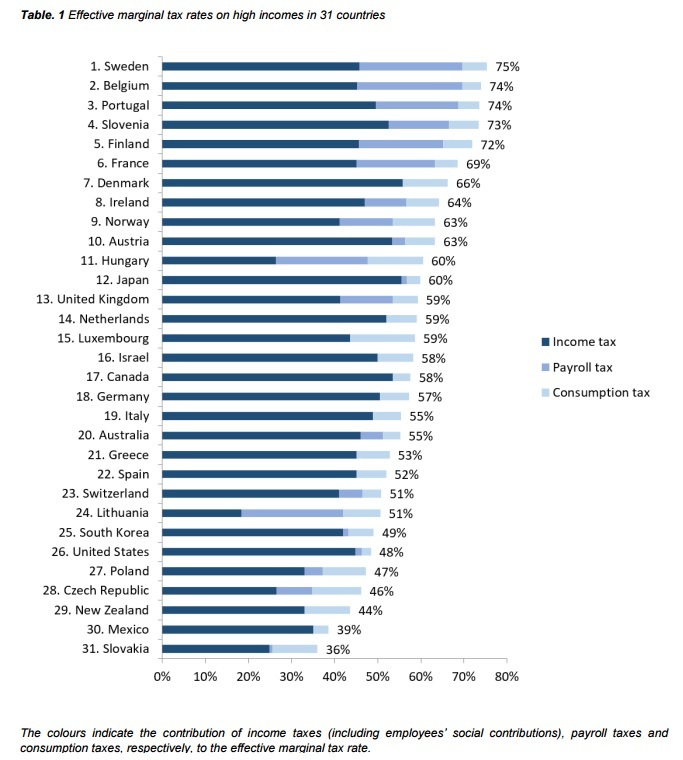 For example in most of Europe if you use that last dollar to buy gasoline, then once you have paid income, payroll, VAT, excise, and climate change carbon mitigation taxes, the marginal tax rate is upwards of 85%. 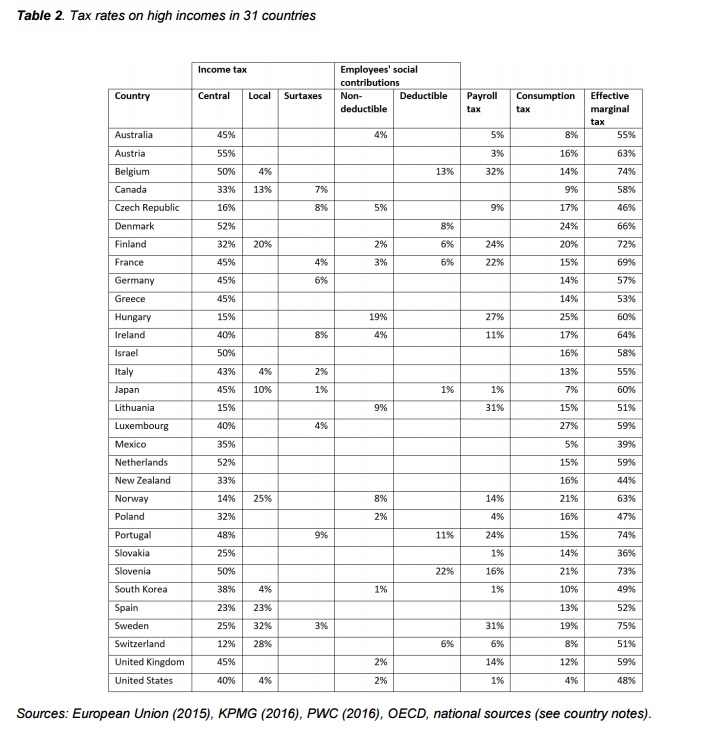 So if you are a competent person in those countries, who also likes personal mobility, then your marginal tax rate is higher. Remember that when you buy, say, gas you also indirectly pay many other taxes, such as the real estate tax for the gas station building, the taxes that the gas station employee pays etc. In general, if you live in a country where government consumes, say, 50% of GDP then one way or another half your work effort is haircut and sequestered by the state, that is, by the democratic majority of your fellow country men, and the politicians whom they elect who want to manage as high a percentage of GDP as possible, so that politician power, politician compensation, and number of politicians per capita, grow ever bigger. If you live in a country with progressive tax rates and you are competent then your haircut would exceed 50%.